An award winning cloud backup service that can meet the demands of any project. ServerMania Cloud Backup is an easy-to-use data protection solution based on cutting-edge technology from Acronis. Providing you with the tools to quickly and easily set up automated backups, so you can rest easy knowing your data is safe. An intuitive control panel allows you to quickly manage and deploy backup services. Deploy on a single server or across hundreds of devices instantly. Encrypt data in-flight and at-rest with AES-256 encryption and 2048-bit SSL. Protecting your servers from a devastating ransomware attack or file loss has never been easier. Instantly create backups of a single file, or an entire data center using backup agents designed for nearly every platform. With packages featuring storage from 250GB to 4TB and beyond, your files will always remain protected through military-grade encryption technologies. Lightning fast file restoration means that you will be back up and running in no time in the event of file loss. 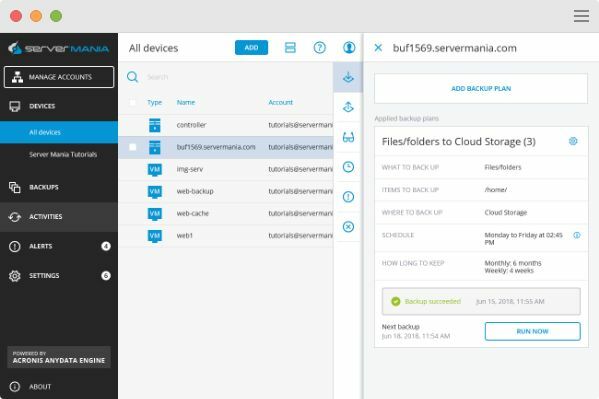 WHY CHOOSE SERVERMANIA CLOUD BACKUP? Decide exactly how, when, and where data should be backed up to meet the needs of your business. Restore a single file, or an entire server in seconds. 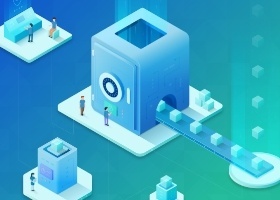 Achieve Recovery Time Objectives (RTOs) of 15 seconds or less by starting your Windows or Linux backup directly from storage as a VMware Virtual Machines (VM); no data movement required. We offer a variety of backup plans to meet the needs of any storage requirements. Choose how much data to backup and where data should be stored. Keep your customers’ data safe with advanced ransomware protection of backups and endpoints, data encryption in transit and at rest, network based login restrictions, and more. Our Cloud Backup plans feature an intuitive control panel which allows you to easily setup and manage server backups. If you have unique requirements, or would like us to setup the service for you, simply contact us and we will assist you. Discover how Cybercrime affects business revenue, reputations, and customer trust. Quickly deploy your cloud backup solution in minutes with our comprehensive video and text tutorials. +How quickly can data be restored? Data can be restored in as quickly as 15 seconds when full server backups are loaded as a virtual machine with no data movement required. +How much data can I backup? We have a variety of backup plans to choose from based on your needs. Should you require a custom solution, please contact us. +Is there a limit to the number of devices I can backup? There is no limit on the number of devices that can be backed up on a plan. Yes we do. Please click here to get started.